The Butler SGA watches a film during an escalation workshop in the Reilly Room in September. Photo courtesy of BU Advocacy Twitter. 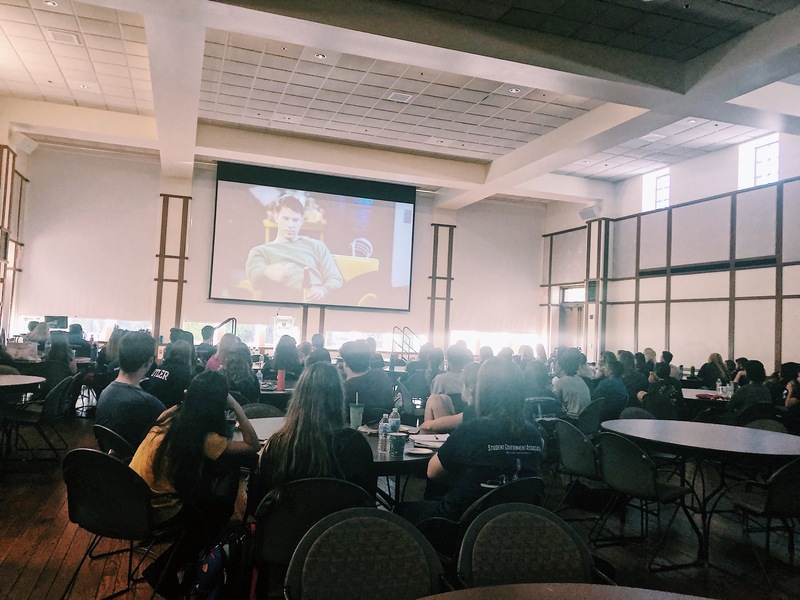 In a partnership between Butler University and the One Love Foundation, the school hosted 17 peer-facilitated workshops about relationship violence during the 2017-18 school year, reaching more than 300 students. In October 2017, Butler’s Office of Health Education and Outreach Programs held 11 escalation workshops for over 600 students, earning the Top School award from One Love. Butler was selected based off the number of workshops, participants and facilitators involved during One Love’s Escalation Workshop Challenge held in October for Domestic Violence Awareness month. One Love Foundation, which organizes workshops across the country, was started by the mother and sister of Yeardley Love. Love was a senior at the University of Virginia who was three weeks away from graduation when she was beaten to death by her ex-boyfriend. The foundation was created to educate people about the signs of unhealthy relationships. “Something that we are trying to do is talk about [abusive relationships] like a cultural issue,” said Emma Ahlert, Butler’s advocacy fellow and an escalation workshop facilitator. Abusive relationships can happen to anyone, with no regard to race, class or sexual orientation. This also includes college students. While men are also victims of abusive relationships, the majority of victims tend to be women. According to a U.S. Department of Justice report, women between the ages of 16 and 24 experience highest rate of intimate partner violence, almost triple the national average. Women in an abusive relationship are also likely to experience sexual assault. One in four women were victims of sexual violence, physical violence and or stalking by an intimate partner, according to the Intimate Partner Violence, Sexual Violence and Stalking survey conducted by the Centers for Disease Control and Prevention. Starting in fall 2016, the school held workshops for every Greek chapter on campus. Last year, each of Butler’s athletic teams also participated in workshops. This year, Butler is placing an emphasis on reaching out to first-year students, who attend workshops through their residence hall units. Butler has 19 student facilitators trained through One Love to run escalation workshops at Butler. Facilitators lead two types of One Love workshops — Behind the Post, which defines ten characteristics of unhealthy relationships, and an escalation workshop. Escalation workshops center around a video called “Escalation,” which follows a college relationship as it progresses into an abusive one with a fatal outcome. Ryan Graham, a first-year marketing major, said the video resonated with him afterwards. According to the 2010 National Intimate Partner and Sexual Violence survey, 84 percent of female and 61 percent of male victims of intimate partner violence told someone, usually a friend or family member, about it. However, the Department of Justice estimates that only 26.7 percent of female and 13.5 percent of male victims of intimate partner physical violence report the crimes to the police. According to the survey, victims typically do not report their intimate partner violence to police because they are unsure if the police could or would do something on their behalf. In October 2014, the U.S. Department of Education added changes to the Clery Act that required colleges to report statistics for cases of dating violence, domestic violence and stalking in addition to incidents of sexual assault. The Clery Act is a federal statute that requires schools to release campus crime statistics in a yearly report. According to the Butler University Police Department’s annual security report, there have been 15 reported cases of domestic or dating violence on Butler’s campus between 2015-17. This is almost twice as many cases per student compared to schools like Notre Dame and Purdue’s West Lafayette campus. Escalation workshops include a student-led discussion session in which participants identify signs of an abusive relationship, which can range from jealousy to manipulation. Students also learn what can be done if they notice someone is in an unhealthy relationship. “Dating violence is pretty prevalent in the United States,” Arthur said, “We really need to be doing more education about it just in general, not just at Butler.